Rogues Gallery from ebay - Caveat Emptor! It drives most serious Confederate students absolutely crazy. For years I was signed up as an eBay buyer and seller but had to stay away because the flagrant misrepresentations and misidentifications simply annoyed me to the point of not participating at all. Some from the professional Confederate philatelic community have tried to officially police that section with the sanction of the American Philatelic Society, but resigned in disgust when their solicited advice was totally ignored on such obvious things as frame lines drawn in on Scott #12s (see "Trouble Spots" under "Confederate Primer Online" accessible from the "Articles" link on this website). Don't let your lust for a bargain lead you astray. Is it really the bargain you think it is? 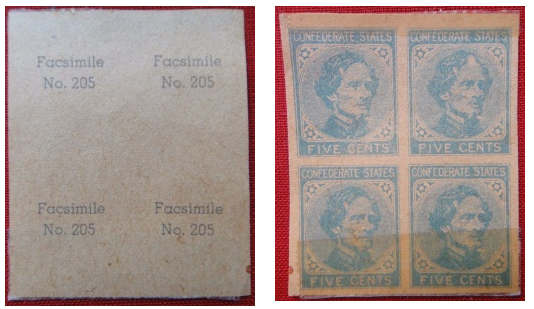 A seller saying that he/she found these rare Confederate stamps in Great Aunt Millie's attic doesn't make it so. They may be scam artists or they may just be ignorant of the facts. 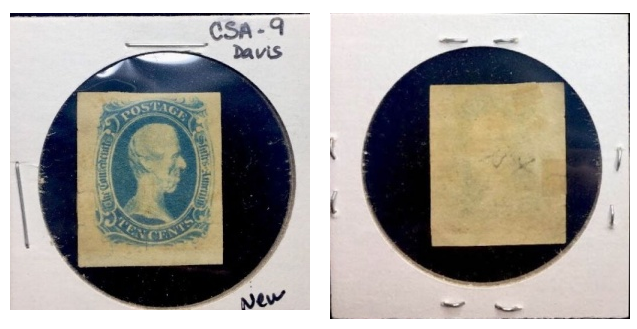 Many Confederate facsimiles and forgeries were created during or immediately after the Civil War. They may indeed be old, but that does not make them genuine Confederate stamps or covers. Samuel Upham first offered his Confederate fakes in 1862, only one year into the war! I had a lot sent to me once (not on eBay) where the seller declared the stamps were taken off the battlefield by his great-great grand-pappy and sent home to his family after he died. I found that they had dealer signatures, collector markings, forgeries, hinges and other clear indications that screamed "foul." He swears it was an innocent mistake. If you are a beginning Confederate collector, stay away from eBay and buy from reputable specialized dealers and auction houses who stand behind what they sell. Expensive or problematic items should always be purchased subject to certification. Read the description very carefully. Descriptions that say, "it may be a forgery" probably means it is. Don't assume because there is a nice collector or dealer write-up that it is accurate, even if that write-up is mine. This is especially true if the write-up is old. One personal example is a provisional I sold that was listed long ago in the Dietz catalog but delisted in the CSA catalog because none of the living specialists in that area had ever seen one, including me. Then two miraculously appeared in old-time collections; they were sent for expertizing and received certificates as genuine. I subsequently sold both and a deceased client sold one at auction. And after all that, they were determined to be NOT genuine. Stuff happens! Old authentication certificates are just that--old. See bullet point immediately preceding this one. Sometimes the knowledge base changes. Also, decades-old certificates often make no mention of serious condition problems. The old way of doing things was to simply say "genuine" or "not genuine" and ignore faults, including professional restoration. And authentication certificates are simply opinions, not guarantees. Compare the terms of sale listed by the seller of your prospective purchase with the Code of Ethics adopted by American Philatelic Society (APS) which is available online. Do they measure up? Would you feel confident that you could return an item that is found to be not as described? Is the seller a dealer member of APS or the American Stamp Dealers Association or National Stamp Dealers Association? Have they been in business, specifically in Confederates, for a substantial number of years? Will they provide references if asked? If the dealer says they are an APS dealer member, ASDA member or the like, it would pay you to verify that - especially if you have your suspicions. There are some former members who still claim to be members who haven't been for years. Educate yourself! Knowledge is power! 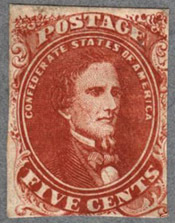 Read up on Confederates stamps and postal history before you buy! What is the return policy, and how much do they charge for shipping? Don't be impressed by money-back guarantees and cheap shipping. If it is a scam, they aren't going to give your money back and they aren't going to ship anything. If you do buy, examine your purchase very carefully upon receipt. Is there an undescribed fault? Sometimes the item is genuine, but the condition is not at all what was described. I once had an eBay seller tell me that at the price I paid for the "Superb" stamp described as having "no faults," I should have expected some faults! I persisted and threatened to leave negative feedback. He gave me my money back and quickly re-offered the stamp with the identical description! (it had a large undescribed thin and was thus anything but superb) Examine your purchases immediately upon receipt and, if needed, promptly ask for a refund. Beware the fuzzy image. This makes it nearly impossible for you to make your own evaluation. This is especially true if coupled with a hefty "buy it now" price. Is there an option to actually communicate with the seller or have they somehow managed to block that option in order to maintain a false 100% feedback rating? This is especially dangerous when coupled with a "no returns" policy. One seller ploy is to run a photo of one item and send you another. Keep a copy of the photo/description and if you are not immediately refunded, report the scammer! If you think a listing is bogus and want to report it to eBay, go to this "report problem"link. This supposedly works, although I've personally had ZERO success with it. For an extra layer of protection, pay with PayPal which has a buyer protection plan. If you use PayPal, use your credit card rather than your own bank account. Many credit card issuers will refund money stolen from you. It is yet another layer of protection. Beware of stamps or covers offered "as is." They are likely no bargain. Beware sellers who do not answer your questions. If you have a question and don't get a reply, DO NOT BID. Beware sellers who say, "I've had it in my collection for a long time; it has to be good." If it does not have a certificate or seller does not allow one or does not allow a realistic time to obtain one, DO NOT BID. Do not let a high number of transactions fool you. The seller could still be a crook. Some of the biggest eBay crooks have the highest number of transactions. Most transactions on eBay go smoothly, but there are bad apples in every walk of life, and eBay is no exception. Stay aware and educate yourself. Problems with stamp transactions on eBay are not new. George Kopecky set up an organization called Stamp Collectors Against Dodgy Sellers (SCADS). MSNBC wrote two lengthy articles based on Kopecky's findings. If you have the time, the following is a very interesting read: http://www.nbcnews.com/id/17171372/#.Wk4lV3lG2ot While this is not tied to Confederates, it is indicative of the overall care you need when buying on eBay. Item number: 163303890812 offered by eBay seller aleksandamarki-0 from Saint Petersburg, Florida. Member since March 11, 2018. Positive feedback of 100%. Set to close on October 18, 2018. No bids as of October 16. 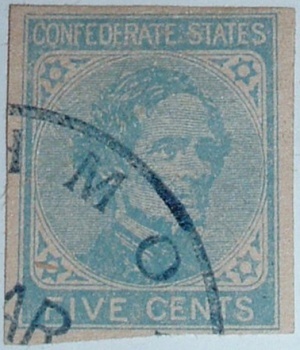 Item described as, “STAMPS of CONFEDERATE STATES ONE CENT MINT NH. Great value amazing stamp all of my stamps are well taken care of." Please if you have any question message me Thank you." Punctuation, wording, and spelling is his. Never mind that it is a two-cent "stamp," not a one-cent. Also, it is likely no gum, not "mint NH." The facts: This is a SPRINGFIELD FACSIMILE, easily determined by consulting The Springfield Facsimiles of Confederate Postage Stamps by Steven M. Roth, Francis J. Crown, Jr., and Patricia A. Kaufmann. Springfield Facsimiles are regularly run on eBay both as the facsimiles they are or incorrectly as genuine stamps. I alerted seller that it was a fake and gave him my credentials. To this, he replied, "Yes i know. No where did i say its real. Thank.you." To this I replied, "Are you serious? That makes you an outright crook! If it is described as a Confederate States stamp it is assumed to be real." RED FLAG! 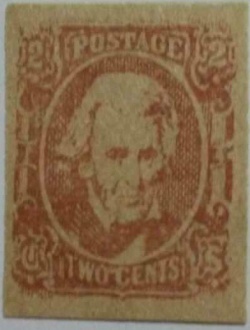 Fuzzy image and inattention to detail (called it a one-cent stamp when is clearly two-cent). While this can happen to anyone (we all make mistakes), the exchange was scary. I think this is the first time someone had the audacity to admit it was a fake and tell me that everyone should know that because of the low starting bid. WOW! RED FLAG! Low number of items sold - 43 as of this listing. Item number: 371961727869 offered by eBay seller history-cellar from Manchester, Maryland. Describes himself as buyer and seller of antiques since 1985. No mention of being a stamp dealer. Has 27,208 eBay sales with 100% rating at time of sale.June 1, 2017. Sold for $9.99 plus $2.61 shipping. One clueless bidder. Item described (sort of) as, “Condition as shown here , Please view Pictures ,Please read listing , Please ask questions if you still have them . The photos of the item are part of the description. They speak louder than words. Please look at photos closely to make your buying decisions. Most products are bought through auction/ estate sale etc. Things I sell are pre owned , estate pieces or used , vintage and or antique . Please feel free to ask any questions you still have after fully reading the description and viewing all the photos provided.” Punctuation, wording, spelling is his. The facts: This is a SPRINGFIELD FACSIMILE WITH A FAKE POSTMARK, easily determined by consulting The Springfield Facsimiles of Confederate Postage Stamps by Steven M. Roth, Francis J. Crown, Jr., and Patricia A. Kaufmann. Springfield Facsimiles are regularly run on eBay both as the facsimiles they are or--unfortunately--as genuine stamps, which they are not. I alerted seller to the facts and gave him my credentials. To this, he replied, "That's hard to believe , who would go thru the trouble of faking a $10 stamp , hardly seems worth . Plus I pulled this myself from a turn of the century album acquired at an estate sale . I can see faking a high dollar item but a stamp worth ten bucks what would be the point." I politely explained that ALL Confederate issues have been faked, many as early as 1862--near the beginning of the Civil War. He reacted by blocking any further communications from me. I reported it as a fake via the eBay reporting system and, per usual, received no reply whatsoever. This is apparently a useless maneuver. RED FLAG! He is an antique dealer, not a stamp dealer. His rationale for the stamp being genuine is that it is old. Interesting that he "pulled it from a turn of the century album." The album may be turn of the century (maybe), but the Springfield facsimiles weren't produced until mid-20th century, making the Springfield products relatively modern. This has a starting bid of $895 as of June 23, 2017. It sold in early July as some unknowing person was swindled out of nearly $900. The seller has a 100% positive rating out of 59,026 sales since 2000. That is a lot of good feedback. Only 1 negative feedback, which was for a misdescribed stamp. Seller georgetownlaw replied that the complainant never emailed him about the mistake (read more about this under "The facts.") There are reasons for this unjustified great feedback. 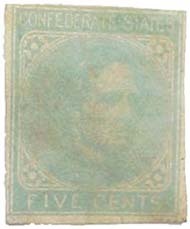 The facts: This is a CSA 12 with four lines drawn in to create the appearance of the scarce Frame Line stamp (CSA 10) See Trouble Spots - Detecting forgeries of the Frame Line - CSA 10 on this website. This is a classic and easy to determine fake with frame lines added. NO ONE should get caught by this. 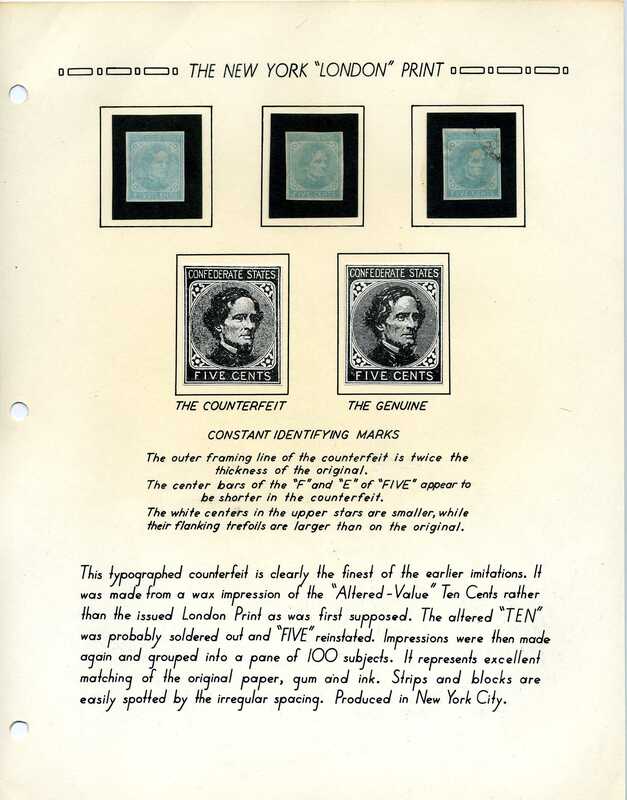 The Frame Line stamp was printed from the same printing plate as the CSA 11, NOT the CSA 12 (which this is and has been altered to catch the unwary). This CANNOT be a Frame Line. Also, and of little consequence, does this stamp look "green" to you, as described? If it does, you too are color blind. It is a classic dark blue usually found on Keatinge & Ball printers (and virtually never on a Frame Line). Keatinge & Ball did not print the Frame Line issue; Archer & Daly did. RED FLAG! Should a seller be hiding his identity and contact information? His name is Christopher L. White from San Antonio, Texas, and he does indeed run a law center BUT he dropped his APS membership a number of years ago when, at that time, the APS eBay committee told him he was selling fakes; he did not like that. Some things never change--still offering fakes and neither eBay nor Christopher White want to hear about that. Ebay does not respond in any fashion. Why bother to have a "report this" link, eBay? RED FLAG! When you attempt to contact the seller about the item, you get a canned eBay reply that says, "We're sorry we couldn't find an answer for you. Unfortunately, due to the high volume of messages this seller receives, they are unable to respond to your specific question right now." Now think about the the negative feedback where georgetownlaw says the complainant never emailed him about the mistake. How is one supposed to do that if you can't contact him? If he did not hide behind his eBay name (undoubtedly chosen to instill confidence), one could more easily check his true status within the philatelic community. I understand high volume, but if there is no way to communicate except to buy a known bad item and return it (exactly how one eBay buyer found out who he is), this is hardly an acceptable business practice. Meanwhile, eBay continues to shield him from valid communications which helps maintain his unjustified high feedback rating. See below for similar problem on another Confederate lot. CAVEAT EMPTOR! If you can't easily communicate with the seller, BEWARE! The seller has a 99.2% positive rating out of 490 sales sales since July 22, 2015. Two negative and two neutral feedback. The facts: On the left is the fake stamp offered on eBay as genuine. 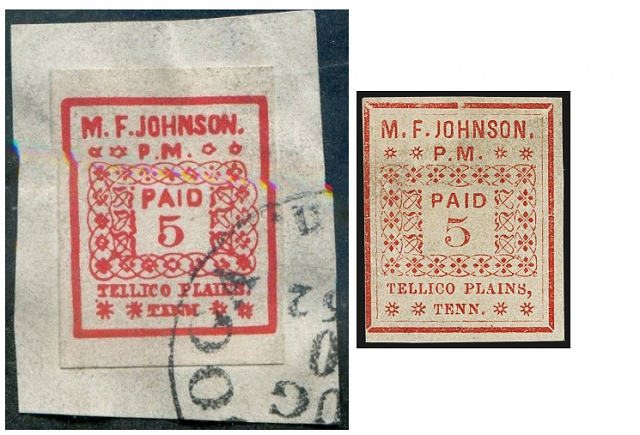 On the right is a genuine Tellico Plains stamp sold by Robert A. Siegel Auction Galleries, Inc.described as "Tellico Plains Tenn., 5c Red (81X1). Setting A with period after "Johnson", unused (no gum), large margins to touching frameline at left, rich color, Fine, with 1980 P.F. certificate, Scott Catalog Value $2,500." This is catalog value is for an UNUSED stamp. There is no off-cover used stamp known! One used on cover catalogs $40,000. Savrastani sold his for $58 after ten bids were executed by six "head in the sand" bidders looking for a bargain. Even as a crude fake, this is no bargain. It is a modern fake. During the seven days this appeared on eBay, I contacted the seller and told him why it was a fake. I told him not to take my word for it but to look at a real one at the Siegel auction site, to which he replied, "Thank you." RED FLAG! The familiar refrain, "It is old, it must be genuine" is totally bogus. Confederates began to be faked at least as early as 1862 when known advertising for "replicas" began. And who but a rip-off artist would put an incredibly rare stamp on eBay? RED FLAG! FACT: there is no off-cover used Tellico Plains recorded! A Tellico Plains used on cover catalogs $40,000. RED FLAG! The complete plating of the Tellico Plains stamp is printed in the CSA Catalog and easily consulted by both seller and buyer. RED FLAG! The stamp on the left (bogus) looks utterly nothing like the genuine stamp on the right. Even a non-collector could easily pick up the differences and yet. The bogus one is printed on bright white modern paper and the ornaments, design elements and letters are filled in. RED FLAG! In a quick review of Savrastani's "positive feedback" are comments such as "variety not cataloged in Scott." Really? My bet is that there is a better than even chance it, too, is bogus. RUN! DON'T WALK AWAY FROM THIS SELLER! ENDLESS OFFERINGS OF FAKES BY SAVASTRANI. WHEN TOLD THEY ARE FAKES, HE POLITELY SAYS "THANK YOU" AND DOES NOT CHANGE DESCRIPTIONS. UNTOLD NUMBER OF OBLIVIOUS VICTIMS. This has a "Buy it Now" price of $219 on April 9, 2017. The seller has a 100% positive rating out of 58,315 sales sales since 2000. That is a lot of good feedback. Only 1 negative feedback, which was for a misdescribed stamp. Seller georgetownlaw replied that the complainant never emailed him about the mistake. More about this later. The facts: This is a Springfield Facsimile, easily determined by consulting The Springfield Facsimiles of Confederate Postage Stamps by Steven M. Roth, Francis J. Crown, Jr., and Patricia A. Kaufmann. Springfield Facsimiles are regularly run on eBay both as the facsimiles they are or--unfortunately--as genuine stamps, which they are not. Now think about the the negative feedback where georgetownlaw lays the complainant never emailed him about the mistake. How is one supposed to do that if you can't contact him? If he did not hide behind his eBay name (undoubtedly chosen to instill confidence), one could more easily check his true status within the philatelic community. I understand high volume, but if there is no way to communicate except to buy a known bad item and return it, this is hardly an acceptable business practice. SOLD for $169 on May 14, 2017. Someone got taken and does not even know it. RED FLAG! This pristine "stamp" has huge margins all around. Not impossible, but surely less likely eBay fodder. It is no wonder that this seller has a 100% approval rating.You can't communicate with him and, although he does accept returns within a 14-day window, that hassle could be avoided if you could only talk to him. I'd hazard a guess that this seller is not aware that this is a Springfield Facsimile. If you can't easily communicate with the seller, beware. This has a "Buy it Now" price of $1,350 on January 5, 2017. The seller has a 100% positive rating out of 271 sales sales since 2011. No negative or neutral feedback. The facts: This is perhaps more a case of ignorance than a willful attempt to mislead. The seller shows a stamp in a coin case--an immediate RED FLAG that he is not a stamp person and there is an excellent chance that he has no clue how to properly describe a stamp. He also offers coins. The second RED FLAG is that he shows a "catalog value" of $2,300. I don't know what catalog he is using, but it sure isn't Scott. Currently, with gum, Scott catalogs it at $950 or $600 with no gum. Since I wrote this caveat, I received a reply to my email to him in which he states, "this is not the definitive price, we listen to offers. I use Mystic's catalog." He did not add that information (Mystic catalog value). He did add this, "SEE PICTURES And GRADING FOR YOUR SELF." Caveat emptor! The third RED FLAG is that he describes it as "LH" (lightly hinged) when two heavy hinge remnants are clearly visible. It is easy to see that the hinge remnant on the left side is sealing a substantial tear and there are at least two more tears along the left side; it also appears to have a serious horizontal crease through the value label. Additionally, it is heavily toned. There is also a good chance there are thins, although one would need to personally inspect it to be sure. .
RED FLAG! If in fact it was "XF" (Extremely Fine), would an intelligent buyer really offer it at half catalog? Don't take a seller's word for it as to catalog value or condition. Your best protection is checking that yourself. It is also critical that you check your purchases immediately after to received to verify genuineness, condition and so forth. This is the case with anything you buy, especially auctions of any kind. Your own knowledge is your best protection. Item number: 401244974276 offered by eBay seller momenstamps. Described as “MOMEN: US CSA PROVISIONALS STAMPS #62X5 NEW ORLEANS UNUSED $ LOT #3133." There is no more detailed description other than "no gum." 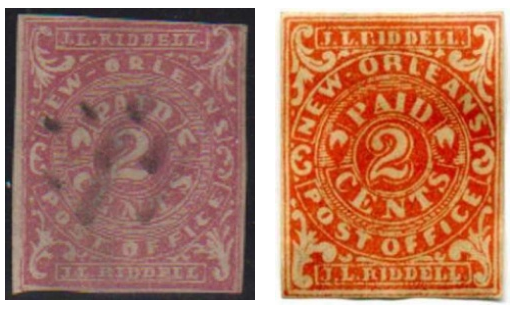 The facts: The offered stamp at left is a well-known FAKE attributed to Samuel Curtis Upham. It is well known to serious Confederate students by the moniker the "waving hand" because of the ornament at lower left which has that appearance with four "fingers" pointed upwards. It is recognized as Upham's poorest and most easily recognized fake. Upham was born in 1816 and accepted as the earliest known faker of Confederate stamps. He was offering "Rebel Notes and P.O. stamps" as early as May 1862, only one year into the Civil War. One comment commonly made by new collectors or heirs inheriting a collection is, "It is old, so it must be genuine." They are partially right, they ARE old. But "old" does not equate to "genuine." This lot sold for $22.59 after 8 bids on December 25, 2016. Merry Christmas, unsuspecting buyer! You bought a fake, purported to be a genuine provisional stamp. The buyer had 334 prior purchases. It is doubtful that he is a specialist in Confederates and, of course, there is no way to warn him before or after that purchase. Fortunately, it was returned for a refund and the buyer gave a neutral rating for the transaction. Seller Mostafa Momen was told the facts about this common fake by me and at least one other colleague, if not more. Momen did not reply. This is not the first time I have seen Confederate forgeries offered by Momen and sent him information which was ignored. There is zero two-way communication. Momen, as of December 24, 2016, on his website falsely claims to be both an APS and an ASDA member. As of January 2, 2017, that false claim also still exists on eBay under his "store." I did a search for him on the ASDA website and he was not listed as a member; I later confirmed he is a former member. Upon inquiry to the APS, came the following: Mr. Momen was an APS member from 2005-2014 and an APS dealer from 2006-2009 but currently is neither a member nor APS dealer member. Momen has literally years to correct his membership status on his website but clearly chooses not to do so to lend the false look of integrity to his business. Unfortunately, eBay makes it so difficult to report something like this that your best defense is your own research and knowledge. Momen boasts that in 2016 he is 38 years old and one of the youngest professional stamp dealers, following in his grandfather's footsteps. I typed in a Google search for "Momen" and Google immediately offered "Momen stamps fraud" as an unrequested option. Obviously, someone else has searched for this. I found his name posted in a strongly negative light on a blog at stampcommunity.org. As of this date, Momen has a 99.7% good rating with feedback in 2016 of 15,009, 26 of which were negative and 31 neutral. Clearly, he does quite a lot of business, much of it without incident. But Confederates are not his specialty and he chooses to ignore all communication. The other RED FLAG is that he has chosen to withdraw from professional and collector organizations--never a good sign, especially while falsely claiming he is a member. My bet is that if you tried to return this for a refund for cause with clear proof of its status as a forgery (easy to obtain as is published as a fake in multiple publications and on multiple websites), you'd probably immediately get your money back or face the wrath of eBay. But for those who have no clue to even suspect fraud, they are in trouble. CAVEAT EMPTOR! If you have concerns about a seller and he purports to be an APS or ASDA member, verify membership with the relevant society before bidding and ascertain whether there are complaints outstanding or have been in the past. This had a "Buy it Now" price of $99.99 on November 25, 2016. The seller has a 99.8% positive rating out of 35,107 sales since 1997. Colonial Stamp & Coin Shoppe is listed as "full time collectibles dealers for over 30 years. "It did not sell as a Buy it Now but was relisted and sold February 7, 2017, to an unsuspecting buyer for $69.99. Buyers should not to be confused with Colonial Stamp and Coin Store who goes by eBay seller neil12443. Both are in New York State. Another similarly named shop is in Cleveland, as well as other locations. The facts: The offered stamp (on the left) is a well-known FAKE attributed to S. Allan Taylor. This stamp was offered and re-offered repeatedly over an extended period of time until someone finally took the bait. I personally emailed the seller at least twice that this is a fake and why. No reply. The stamp shown on the right is from my retail stock. It is quite easy for even an untrained eye to see that they are nothing alike. The color is off, the corner ornaments are substantially different, the rate "2" is formed differently. The differences are too many to enumerate. And the "cancel" is a joke. There is no genuine cancel that comes close to resembling it. Thus, in spite of the high number of listed transactions, the fact that the seller does not respond to communications and clearly does not known Confederates, is a good reason to stay away. Your best defense to buying on eBay is your own knowledge. Item number: 222320113617 offered by eBay seller libra_1985_9 on November 20, 2016. 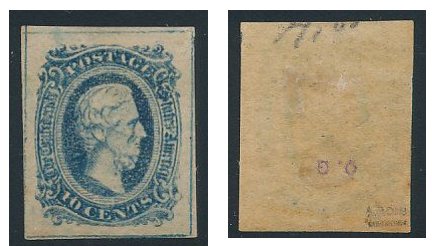 Described as a "RARE 1862 JEFFERSON DAVIS SHEET OF 4 STAMPS MINT SC#7B PRINTED ON BOTH SIDES" with a starting bid of $5,000. This seller is also offering two U.S. stamps with similar ridiculous descriptions and starting prices--a 1-cent Columbian and a 3-cent Banknote issue. This seller has a feedback of 100% on 15 sales, most of which appear to be jewelry and clothing. Seller replied with, "thank i do not known." I suspect not American, possibly an heir or garage sale scrounger who did not consult a stamp dealer or collector before offering. However, the item(s) were not removed from eBay nor the start price lowered. No doubt the seller is still trolling for a sucker. The facts: This is a common SPRINGFIELD FACSIMILE and, more obviously, it is even handstamped as such on the back! Obviously, the seller is not a collector. Apparently he/she also is unaware of the definition of "facsimile." As icing on the cake, there appears to be tape across both the top and bottom of the block. Item number: 252636471151 offered by eBay seller savvystamp. As of November 15, 2016, they had 100% approval rating and 3005 sales, but there is nothing savvy about seller's knowledge of Confederates--maybe just how to separate you from your hard-earned money.. This is a "Buy it Now" item with a price tag of $7,500. It is described as, "Confederate 10 Superb!!! CV As "98" $40,000.!!! Full OG LH 100% Sound Make Offer"
The facts: The 4-frame Frame Line (CSA 10) shown in the photo is certain to have drawn-in frame lines (AKA FAKE), although it sports a May 15, 1956, Soler certificate in Spanish stating that it is genuine and sound. It also has other foreign authentication backstamps, one of which is O. Guerekian, with whose name I am unfamiliar and could not find listed on a list of worldwide experts. The other 2-line handstamp is unreadable due to the poor quality of the photo. Soler is known for expertise in Spain and Colonies, not Confederates. Although difficult to see from the quality of the photo, the lines appear to be lighter in color than the stamp. The printing also appears to be a Keatinge & Ball printing, which would immediately disqualify it as genuine, as they had nothing to do with printing the Frame Line. At the least, one should immediate be suspicious of a fuzzy photo and high price tag. Having a 60 year-old authentication certificate from an organization not recognized as having expertise in Confederates is the other "heads up." These facts were politely pointed out to the seller who--no surprise--did not reply. UPDATE: August 1, 2018. This is listed for $3,000 net on Earl P. L. Apfelbaum website as stock number 404176. Described as "Very Fine, no gum, signed ROIG (Soler) with his photo certificate." Still a piece of junk. Caveat Emptor! I guess these sorts of things just continue to be passed from the unknowledgeable to the shaddy characters in our hobby and back again until some unsuspecting victim finally bites and pays the price for not properly researching before buying. Item number: 182339350814 offered by the GSC Foundation under eBay handle dac4autographs. As of November 2, 2016, they had 100% approval rating and 1998 sales. 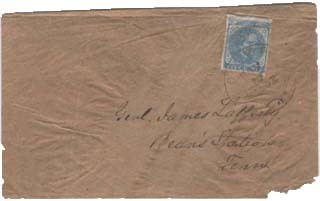 The seller states that this cover catalogs $800 and, yes, that is true for CSA 11 single on a wallpaper cover--if genuinely used in 1863. 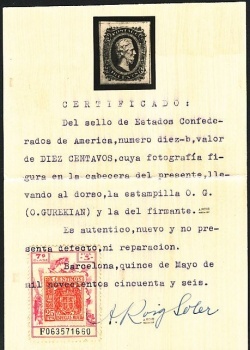 The other side of the "cover" is shown with a seriously blurry image of a 1932 stamp and cancel. The exact description, in all caps and with lack of most punctuation, is: "YOU ARE BIDDING ON A USED BLOCK OF 4 1863 10 CENT CONFEDERATE STATES OF AMERICA STAMPS ON A WALLPAPER COVER THE STAMPS HAVE A BEAUTIFUL POSTMARK JUN 31, 1863 RICHMOND, VA THE BACKSIDE HAS AN ADDITIONAL 1932 U.S. 3 CENT STAMP SCOTT CATALOGUE VALUE $800.00"
The facts: The item is a tattered souvenir wallpaper cover from the 1932 done by August Dietz for a reunuion of the United Confederate Veterans; it is well known to serious Confederate collectors--and it is clearly a tattered front only, not a full cover as claimed in the description. As issued, there was a 13-line printed description on the flap of the envelope which told the story. This description is conveniently missing. It is no wonder that this seller has a 100% approval rating. You can't communicate with anyone to give them information about the item so that the description can be corrected. Under "Ask a question," the "Other" option has been removed. Likely, this seller has already been told this. This is coupled with a NO RETURNS policy--always a huge danger sign. RUN, don't walk, away from this seller. Item number: 350073193499 with a starting bid of a whopping $1,400, end time June 30, 2008. Seller dodos007 from Miami and Buenos Aires. 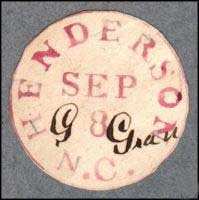 Item described as "Confederate Postmaster Provisional signed G. Gran at Henderson, North Carolina (not in Scott) lot (sic) to shape, with cert." The facts: This Henderson "provisional" is a pre-war hand stamp. Henderson used red ink before the war and black ink during the war. The purported certificate is not shown nor quoted, nor does the description mention the issuing authority. If it isn't listed in Scott or the CSA Catalog, there is probably a reason! When asked for a copy of the certificate, the seller said there was no certificate, just that you could get one if you wanted one. At the least, get a scan of the so-called certificate and verify it before you bid / make a very expensive mistake. It would be wise to check first with an independent authority you trust. Seller was informed by several Confederate specialists that this was not as described, but chose not to remove it from sale. Fortunately, no one fell for this. It did not sell. Okay, so this isn't a Confederate example and it isn't recent, but this is certainly one of the largest philatelic scams perpetrated on eBay. 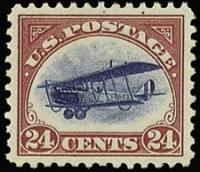 A seller offered a C3a (Inverted Jenny) for sale with a winning bid of $35,000. 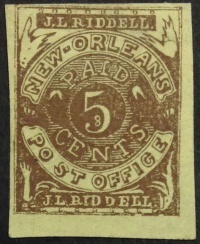 The seller did not own the stamp and had simply used a photo from the February 1999 Siegel auction catalog which he posted as the stamp for sale. These rarities are very well documented so it was inevitable that the perpetrator would get caught. It is just fortunate that he was before any money was lost. The scam was uncovered when the winning eBay bidder refused to pay until he could examine the stamp and the provenance. The seller claimed it was an inheritance from his grandfather. The same seller was also offering other expensive stamps and coins that he did not own and using scans of old auction catalog photos. This is an extreme case, but it also happens with much lower priced material where the seller simply keeps the money and never delivers the material. If it's too good to be true, it probably is. Item number: 250274709749 ending July 29, 2008 described as (copy/pasted exact wording with third grade spelling errors) "USA. ORIGINAL PLATE ESSAY!! WITH CERT. IN EXTENSE!!! 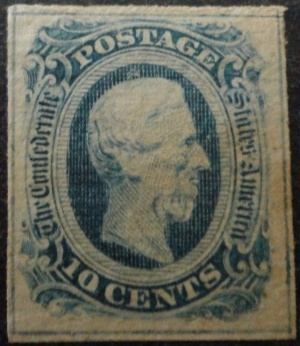 SCOTT 1 CV US$ (40,000) ...CONFEDERATES. ORIGINAL PLATE ESSAY IN STOUT RICE PAPER IN OTHER THAN ISSUED COLOR...SUPER TOP RARITY...A MAGNIFISCENT ADDITION TO THE TOP WORLD NR ONES TOPICAL COLLECTION. WITH CERT IN EXTENSE. Starting bid $390. Buy it now price $800." The facts: This is a Birmingham forgery offered by the same party, slightly different name, as the Henderson NC item in the first example. See Birmingham description on this website on the CSA Gallery of Curious Things Fortunately, when shown information on this website as a Birmingham forgery, the item was immediately withdrawn. Item number: 180290007921 ending September 23, 2008. eBay seller name: siriusstampsandcoins, California. Cover described in heading as "cover may 17 1862, prisoners cover ?" with a starting bid of $120. When questioned, the seller said (spelling is his, not mine), "hi i think it is because it is a put together cover made out of wrapping paper of a thin tissue. i really dont no, thats why i put a question mark for those who might no. it still is a unique cover." The facts: Nothing about this remotely says "prisoner of war". Had he done even the tiniest bit of homework in an area about which he clearly knows nothing or taken heed of comments, this would not be so listed. It is a common cover in poor condition not worth anything near the starting bid. WARNING! If there is a big question mark or disclaimer in the description, you'd best shy away unless you know the area well. Item number: 250283829550 ending August 24, 2008. eBay seller: mjones78660 of Kyle, Texas. 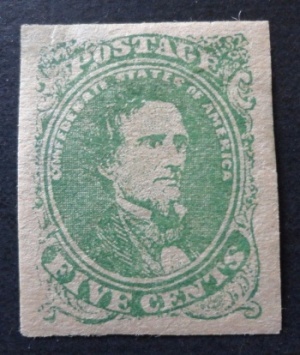 Described as "Sc# CSA 7, 5c Jefferson Davis, 1862, MNG, See Photo! Mint with no gum. Low Start & No Reserve!" Unfortunately, this garnered five bids and sold for $5.50 plus $1.00 shipping. See CSA Gallery of Curious Things under "CSA Authentication" link on this site. Details of the often encountered New York Counterfeit and how to easily differentiate it from the genuine may be found there.